Old Lyme’s Ciara Klimaszewski, right, battles North Branford‘s Olivia Rodriguez for the ball during North Branford’s 1-0 win Saturday. The Wildcats not only have dominated the regular season, but also won four straight tournament titles. 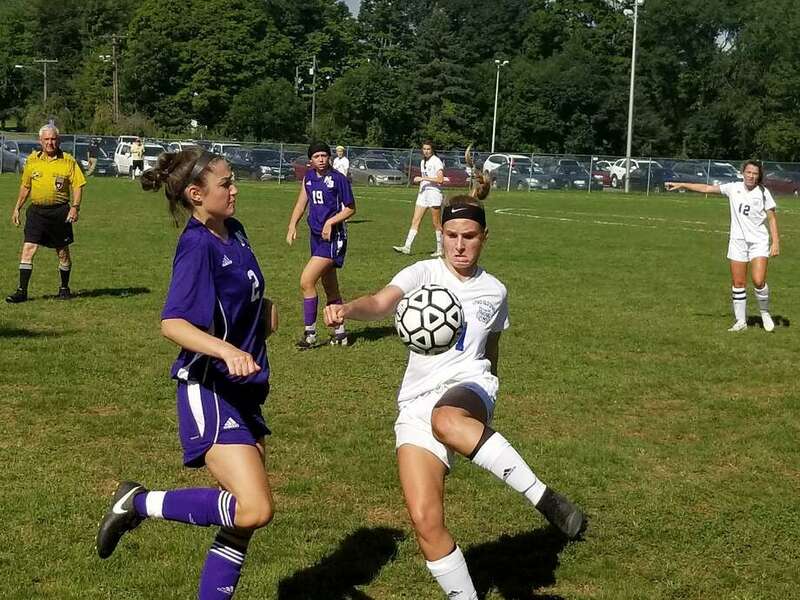 Then North Branford derailed Old Lyme’s drive for a fifth straight, upsetting the Wildcats in the tournament final last November. The Thunderbirds did it again on Saturday, beating Old Lyme 1-0 at home thanks to Alexie Rosado’s second-half goal and a sturdy defense. North Branford (2-0-1) is the only team to defeat Old Lyme (1-1) since the start of last season. The last Shoreline team other than North Branford to beat Old Lyme during thee regular season? Valley Regional back on Oct. 7, 2014. Rosado was able to score off a tough angle less than 8 minutes into the second half. The sophomore took a pass from Ana Pavic, ran down the right side and sent one in that went between keeper Samantha Gray’s legs and into the net. “I tried to shoot it hard and low to the ground and hope for the best because it was on a weird angle,” Rosado said. Thirty seconds after the goal, Old Lyme’s Mya Johnson, spun and fired, but North Augur was right there for the save. The senior bound for Boston College next fall made seven saves, five in the second half as Old Lyme put the pressure on. It did look like the Wildcats had gotten the equalizer when Britney DeRoehn one-touched a Johnson pass into the next with 4:45 left. But the goal was disallowed because DeRoehn was offsides. Old Lyme, the reigning Class S state champion outshot North Branford 13-7. Both teams have really beefed up its respective non-conference schedules to get ready for postseason play. North Branford plays Law (Thursday), a SCC tournament finalist last year, and Mercy (Oct. 17), both on the road and Woodstock Academy (Oc. 6) at home. Old Lyme plays at Hand (Sept. 24), the defending SCC champion, Holy Cross (Oct. 6), the team the Wildcats beat in the Class S final, at Woodstock Academy (Oct. 13) and at Cheshire (Oct. 24).